We’d like to thank our wonderful customers with a day dedicated especially to them. Please join us for a celebratory shopping party on Thursday, November 20th from 10 a.m. to 9 p.m. It’s the perfect time to escape the crowded malls and enjoy some holiday shopping! As always, shoppers can find one-of-a-kind creations and unique designs that are distinct, beautiful and creative. There will be live music, delicious food and beverages, and prize drawings. 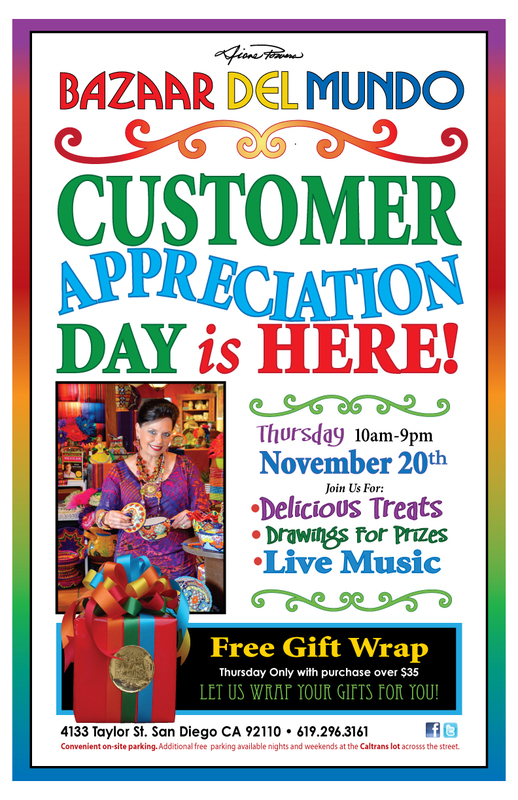 The Shops will also offer free gift wrapping on purchases over $35. Chuao Chocolatier will debut new delectable flavors, and a number of guests will join us including Mywalit, Danny Goode Silks, Patty O’Neil (Moroccan clothing and jewelry), Linda Zaiser (collectible santa and angel dolls), and soup vendors! This entry was posted by The Bazaar del Mundo on November 17, 2014 at 9:33 pm, and is filed under Events. Follow any responses to this post through RSS 2.0. You can leave a response or trackback from your own site.